SBC Macey Golf Day drives more funds for 3 local charities. We certainly picked the day for another successful SBC Macey Charity Golf Day this year. Held at the Worrigee Links Golf Club again, the par 70 course proved to challenge and entertain every player all in the name of charity. With a stunning morning and with an early breakfast sponsored by Parrish Plumbing, it provided a great shot gun start for another successful day for all levels of golf. The hot windy day was a challenge for some, but thanks to the cold refreshments from the Webics drinks cart provided the players with appropriate rehydration over the course including the sponsored novelty holes. 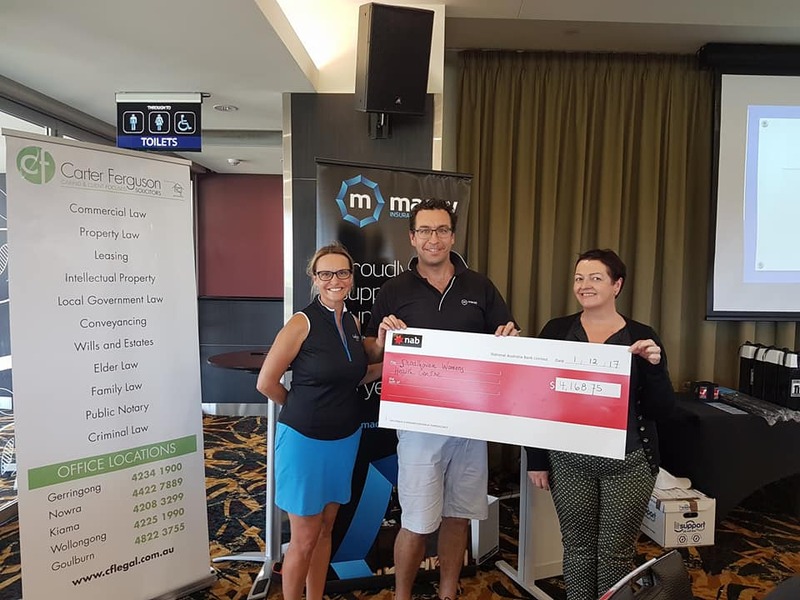 This year’s chosen charities were the Shoalhaven Women’s Health Centre, Safe Shelter Shoalhaven & CareSouth Shoalhaven Youth Support Services who each went home with a share of the day’s raised funds of $12,506. Macey Insurance Brokers are always proud to sponsor the golf day and would like to thank all our hole sponsors and everyone for their kind donation of money and time on the day. It wouldn’t be a success without the support from our local business network.